Happy Tuesday, friends! I'm not sure what the weather is like your area now, but it is a dark and gloomy day here in Indy. Somehow this seemed like the perfect recipe to share, since it's so bright and colorful, and all the fresh produce really makes me think of summer. So in addition to getting back into the blog recently (yay! ), I've also gotten back into Pinterest and all the visual inspiration that comes with it. This recipe is one of those gems, and we went crazy over all the flavors. It felt light and refreshing, and came together in a flash. I will definitely be making it again! *Spray a sheet pan with cooking spray. Place salmon, skin side down on pan. 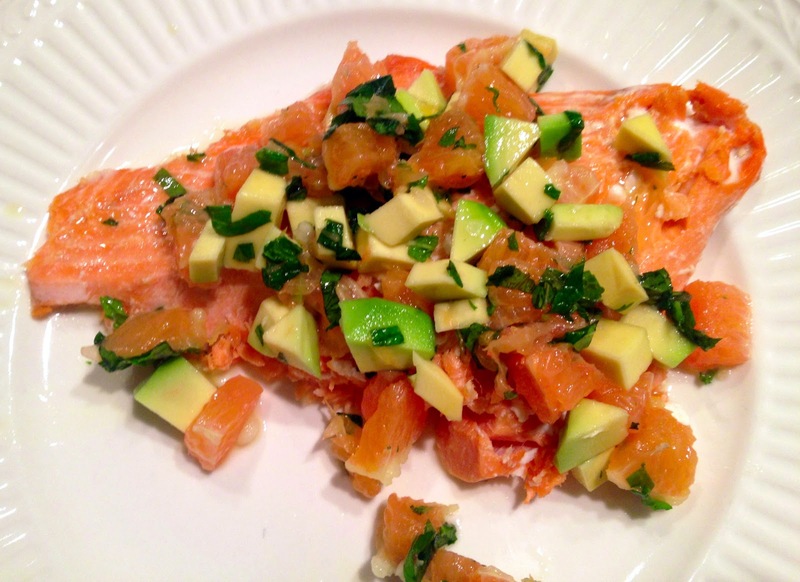 Drizzle olive oil on salmon, and rub in. Sprinkle salt and pepper. Bake for 20 minutes. 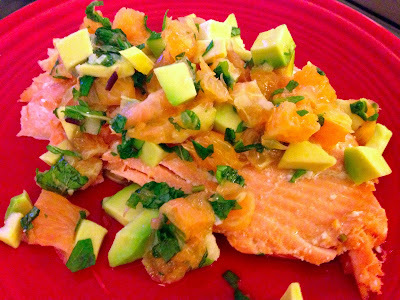 *While salmon is baking, combine avocado, orange, garlic, lime juice and mint in a small bowl. Set aside until salmon is finished cooking. 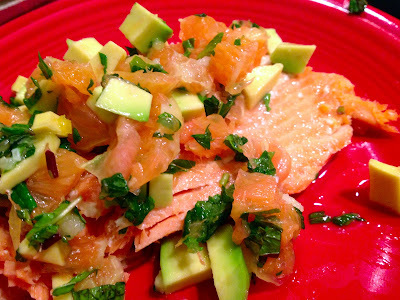 *Remove salmon from the oven, and top immediately with salsa. Enjoy! all done - and look at those colors! a red plate for even more color - I'll take it in the winter! Yum! That looks so good! I think I pinned somewhere a salsa made out of pineapple. Really should explore fruits more often. I hardly ever use them in my cooking. Thanks! 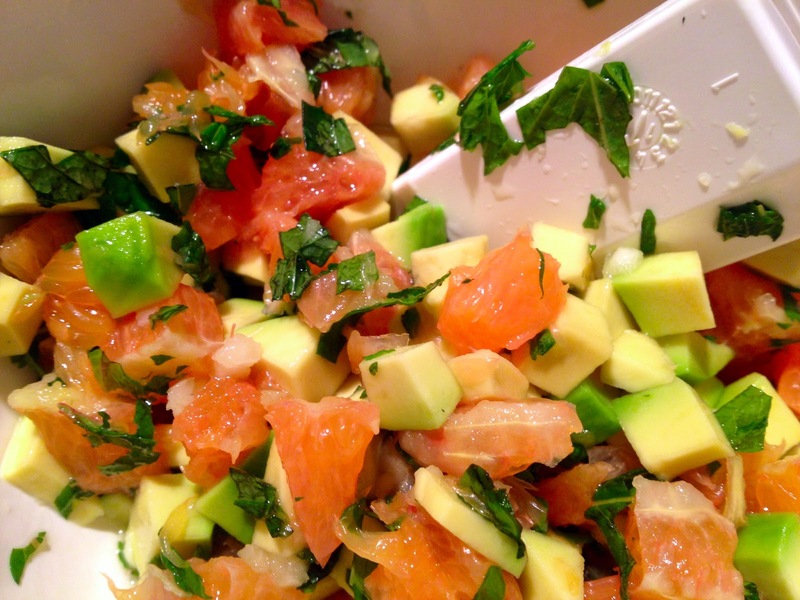 It really was such a great combination of fresh flavors. I had it last night for dinner and today for lunch and only wish I had some more of that salsa! I definitely need to incorporate fruit into more dishes. Let me know if you come across any good ones!